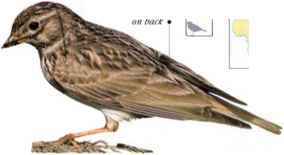 A lark of bare, dry places, this species is often seen walking or running on the ground. Occasionally, it settles on a branch after a short, low flight. The diet consists of seeds, plants, and small invertebrates. • NEST A cup nest sunk in the ground, beside a stone or tuft. • Distribution Parts of southern Africa.